Had a brilliant time in Cardiff. Despite what I had seen on the interwebs, it is a very civilized place. P did point out we were hanging around in the equivalent of the Deansgate area, posh shops and hotels, but still I stick to my opinion that it is a nice city. Saw more homeless people than I’d have expected to, so it’s not like it’s perfect. But I also notice lots of recycling stuff, including a poster for a kitchen waste scheme, and a graffiti sticker saying Love Celtic Hate Racists, which I approved of. Plus, the local brewery is called Brains (I kid you not) and seeing that on so many pub signs gives the place an imminent zombie invasion vibe. The castles (Cardiff Castle and Castell Coch) were amazing, for thosewith an appreciation of neo-gothic interior design and for those who just like to laugh at those crazy Victorians. I hadn’t realized that William Burgess had been so involved in the redecoration the 3rd Bute dude did at Cardiff Castle, so that was a nice surprise for me (having been really temped down to Cardiff when I found out about the Burgess redevelopment of Castell Coch). They were both characters, oddidealistic Victorians with loads of money. I find it very interesting that the richest man in the Victorian era spent a good deal of money on stately pleasure domes, which in a few generations were handed over to the public for economic reasons. So now we all get to enjoy them. The guides at Cardiff Castle and Castell Coch both had the genuine enthusiasm of people who love their work. The bus ride out to Castell Coch was straightforward, and the driver gave me instructions for walking up to the castle (as well as telling me the correct way to say it- bit like coke and loch, not like a rooster). The tourist information leaflet did say it was an uphill walk, which seemed an odd thing to say, but when you head up the last part of the hill, it is a steep climb. The castle sort of sneaks up on you, and it is really like going into a fairy tale. Fitting, as the decoration features Aesop’s fables and crystal balls. The weather featured rain showers and howling wind, making it even more romantic, especially enjoyable if you were in the nicely heated rooms. Unlike the days of rain here, the Cardiff area seems to get short, sharp showers followed by clear spells, not long enough to dry off, but long enough to feel foolish if you keep your hood up. The tea room at Castell Coch is also perfectly charming. Though I onlyhad a cup of tea, the homemade cakes looked scrumptious. Very cosy. Bit disappointed that the Welsh recipes tea towel they had was for using, not for sale at the gift shop. I got one with animals from the fable’s instead. Another pleasant thing about Cardiff is the thriving haberdasheries on City Road. I especially liked Butterfly Fabrics, where they didn’t mind me ogling the Liberty prints before buying a much cheaper fabric on special offer. I also got some sweet butterfly trim. Hopefully, both will inspire me to do some sewing. After reading the Art of fabric collage by Rosemary Eichorn, I’m hoping to try something like that in December, lots of layers, lots of patterns. But not with Burgess style patterns. I just don’t have that completely over the top attitude. The novel writing took a bit of a hit while I was away. 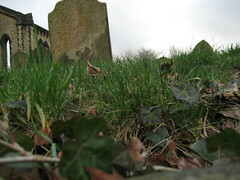 I was too worn out by sightseeing to write much (I strained my neck gawking at everything), though I did get a bit done. I’m now about 5 days behind where I should be. In a way, I’m looking forward to the end of the month, just so I can stop writing all the time, or rather, in all my free time. But until then, I still have the motivation to continue. I’m still working on my nanowrimo novel. Most days I’ve managed to scribble out notes on the bus, then after dinner I’ll start typing them in and add a bit more while I’m at it. During the first week, I’d only get about 550 words written on a weekday. I improved in week two to writing 800 words, but it still means that at the halfway point I’m only at 22,000 words. I’ve been enjoying writing on the bus, but I admit that what has kept me going is Pete’s encouragement. Standing beside two older white men at the bus stop, I realized they were discussing the race issue. "...Jamaicans, Chinese, all mixing together. It's great!" My nanowrimo project is going fine, putting down lots of notes on the commute to work. Must get typing now. My mother in law sent a link to a Woman’s Hour segment, because she knows I’m interested in embroidery. Perhaps I’m just showing my age, but I do get a bit grumpy when people talk about a ‘new generation’ making embroidery exciting. IMHO, these people are just expressing their ignorance of embroidery and other arts and crafts in general. I’m not an expert on embroidery (just an enthusiast), but I know people of all ages are innovating, and also following well established paths. And they aren’t mutually exclusive groups. It didn’t help my mood when Twisted Threads (who did the excellent quilt show this summer) sent out a picture of happy people at the Knitting and Stitching Show who all looked younger than me. It’s great to see them enjoying the event, but I can’t help thinking the image excludes a lot of older people who also had a great time there. One of the great things about handicraft is that age doesn’t matter. 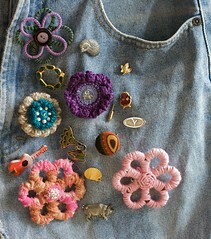 I remember an embroidery kit I did as a child, a paint pony and stylized sun on light green canvas. Straight stitch and satin stitch in big, chunky threads; simple, effective. No idea where it is now, but I still enjoy the memory. And I fully intend to enjoy embroidery for the rest of my life. Maybe I’ll even get good at it! But before I sound too negative, I do have to agree with what Ms Gardiner said on Woman’s Hour- I’m not interested in debates about art, I just want to embroider and enjoy other people’s work as well. As a guild member, I ought to be more concerned about promoting embroidery, but thinking like that makes my brain hurt. I don’t really want to argue a point; I want to play with string. At the moment, that means wrapping plastic rings from drinks bottles. display this spring, pulling together lots of scrap fabrics, but all generally red. I never did knit on the bus- I think I’m afraid to wave knitting needles around like that. Instead, I’ve been prototyping a variation on the rag-bag that I got from Tanglecraft. The idea is to sew a zipper to a lining fabric, then put the card frame inside that lining. The warp is stitched through the fabric of the zipper rather than laced over a comb, but the weaving pattern is the same: weave side one, flip, weave side two, flip and repeat. Smaller size frame is easier to handle without a shed stick. 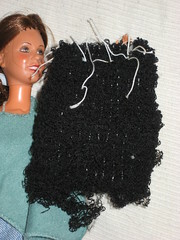 Most of the weaving was done using a hair clip to thread the weft through, then a darning need to fill in the top bits. Used some tiny (like under 3 inches long) bits of blue yarn I had scavenged at the 8th Day knitting club ages ago. I do like how these rag weavings can incorporate tiny bits of colour. 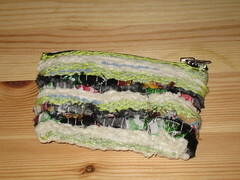 It was nearly impossible to get the card out of the bag when the weaving was finished. I had overestimated how far the zipper unzipped. Even after bending the card, I still caught and snapped the warp thread at the far end. It wasn’t hard to tie back together, but it could be a flaw in the whole process. Or maybe it’s just because I used a chunky zipper. After the problems with getting the card out, I zipped the bag shut and the head of the zipper came off the end! Luckily it aligned and went back on. The zipper also caught the lining fabric. Zippers are tricky. The un-even edge to the warp threads where they are sewn into the zipper. I tried covering these with a line of un-even chain stitch, and it was an improvement. Future experiments need to be more precise in stitching the warp. The ends of the zipper stick out at the top, and the weft doesn’t cover them. I added some stitching when it was off the frame, but it looks rough. Zippers are tricky. That’s a lot of bad and ugly, but it was a good prototyping exercise. I know the idea works, it’s just a question of refining it. Truth is, I don’t need a coin purse- I’m perfectly happy with the wallet I’ve had for the last 10 years. But I’m interested in trying to make a pencil case, or maybe a bag for an odd shaped object, like a ukulele. It’s a case of curiosity rather than necessity. Also, to make my blog more usable, I’m going to try to tag entries now. Hopefully each entry tagged as a prototype will be followed up by a beta, then finally with a set of full instructions. It’s a plan. Just back from a lovely trip to Birmingham. The fantastic Festival of Quilts at the NEC drew me there, but also had a nice visit with relatives and checked out the Warehouse Café and ate at Jyoti's (fantastic Indian vegetarian restaurant and sweet centre- 1045 Stratford Road). We’d been to the Jyoti's before, at the old premises, and the food is just wonderful. I recommend the pani puri, and the bhajiya selection is both many and varied as well as extremely tasty. The Warehouse Café was new to us- how have we overlooked it for 15 years? The raspberry vegan milkshake is perfect on a hot day, and I love the mis-matched table and chair theme they’ve got going. And the wholefoods shop next door was convenient for travel snacks. But for the main attraction: Festival of Quilts 2009 was exhausting, in a very good way. I’m not much of a quilter, but the stuff on show was so impressive. A friend in the Embroiderers Guild had told me about last year’s show, and this one more than lived up to my expectation. I arrived early, around 10:30, and before noon I was already suffering from inspiration overload. My pictures don’t do justice to everything there. 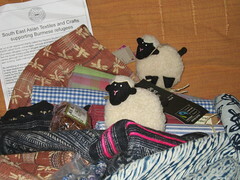 Best thing at the show: Fair Trade Fabric Ltd stall! For years, I’ve been reluctant to buy non-fair trade fabric, but not been able to find fair trade fabrics for sale. It looks like things are changing for the better! The fabric is lovely to touch and I suspect it will be wonderful to work with. Now I need to find a project to make with it! A confession: I was really bad and didn’t buy a catalog on the way in, and when I was leaving, my mind was too numb to remember to buy one then; so I’ve been unfortunately negligent in crediting the quilters whose work I photographed and put my flickr page, and I also can’t credit anyone on my blog. How embarrassing. Fabric manipulated so it doesn’t lay flat: peaks, folds, puffs, wrinkles, tassels, ribbons, etc. The best of show group quilt wonderfully put together, lovely soft colours (which I see as modern- not part of my traditional quilting lingo). Beautiful. I overhead a criticism that it was a great quilt, but not original, and so of course started thinking of the role of originality in art. And it strikes me that any quilt made here today is art, as in it isn’t simply a functional item. If you’re cold in bed, you buy a £20 duvet and cover set. Quilts are items people just want to make. The only bad point of the day is that I didn’t find any nylon embroidery ribbon. I did notice some silk embroidery ribbon, but I feel too sorry for the silk worms to buy that. Shall have to keep looking. I posted it to Su, and you can see the ‘after’ on her blog! Not undamaged, but I'm so glad I posted it. On the weekend, I thought I should just put away the purple flower crochet, and start on a new weaving project. But that would mean I would have to put away the crochet somewhere, and thinking that made me realise I was thinking about this wrong. I have this ‘issue’ with using up stuff, and I was actually anxious about wasting the purple string on a project I might not like. But why do I have the string if not to use it on this flower? So, rather than putting it away, I started to work on it more. And I’m starting to like it more, with that extra layer of crochet on it. I also decided to add a nicer embroidery thread in the centre, something less shocking than the bright yellow, then use the yellow just for some final stitches in the centre. A good exercise in not hording. 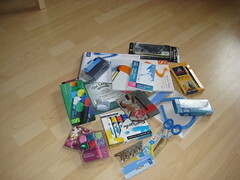 Additional bonus: P just gave me a bit of cardboard which will be great for the weaving project I aim to do next! 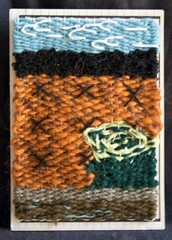 And a note: Finally posted the woven postcard- wonder if it will arrive? Cutting a very simple shape (based on a rubbing from a drain pipe fitting on the Triangle, which I had made at an earlier class), then arranging on paper, and being able to see the different shapes that made. It all became clear! At least for a while. On a bus crafting note, currently I’m back to writing the sprite thief story, taking on board suggestions made and my own ideas for improvement. Honestly, I didn’t think placing a time limit on the comic book buscrafting would work, and I’m not sure how it did, but on the Friday commute to work I finished roughing out the last page! Magnifico! Still not sure what the next step will be with the comic, but it feels good to have the whole 22 pages roughly sketched out. I’m thinking the next stage is to actually figure out how to take it to a finished product, then decide if that’s do-able. Which is nice in a way, because it will give me a chance to do some of the weaving projects that have been building up- my DIY Weaving Club Membership Card, a postcard and, assuming I finish the second clanger, a clanger dress. Yesterday, I went to one of the Handmade socials at Urbis- it was a session about how to screen print run by Ayesha Ansari, an enthusiastic community artist. I knew I wanted to make a stencil from one of P's photos, but Ayesha thought it was too small, so I added the house to it. Screen printing is really fun. Ayesha's enthusiasm for it is catching! I'm glad I went to a session where I could try it out, because I've read about it but didn't understand the process until yesterday. The whole point of the screen is to hold the stencil in place. We just used thick paper for the stencils, but I can see how a plastic one would be more durable. I'm now wondering about using confetti, leaves or feathers; and could you use a thick screen, like a bit of hessian, to have a patterned painted section? It is tempting to buy some basic equipment, but I think I need to let the ideas brew for a while. Lots of other stuff in the pipe already, but if I can find space for a screen in my craft area I suspect it will go on my wish list. And for the buscraft report: I've now roughed out 11 pages, but finding it very slow. I hadn't realised how mentally taxing the layout of the comic book would be, and honestly, I'm just not at my sharpest first thing in the morning or right after work. Twice I've thought I should just put it away and try something else, but then had fresh ideas and made progress with the comic again. Frustrating. I'm going to stick at it this week (just 4 days) and maybe next weekend try to finish this stage off. A suitable title for a Star Wars Day post, but it also refers to my progress on the DIY Weaving Club Rag Bag project. The buscrafting bit is done, and the basic bag is complete, but I still need to do a lining. Will I ever get around to that? Now that the weaving is complete, I'm going to try something different: drawing a comic book. I'm tired of thinking that I can't draw well enough to do the style of comic I'd like to. It discourages me from drawing at all. So, I'm going to take my sketch book on the bus, and just have a bash at it. The idea is that there's no way to draw neatly on a bus that's jostling its way through rush hour traffic, therefore the pressure to draw neatly disappears! I'll be lucky to have anything recognizable at the end of the journey, but anything I do will be better than just feeling bad about not being able to draw how I want to. And I'm a bit overwhelmed by all the fabric crafting that I've built up. Joyce at the Embroiderers Guild was advising finishing one thing before starting another. Awfully good advice. Thursday, as I was weaving, I dropped my bag of yarn. Not much fell out onto the floor of the bus, but I couldn’t reach it, mainly because I still had the weaving and a bag of groceries on my lap and the seat beside me was inconveniently occupied. The occupant got off at my usual stop, and I stayed on, putting my shopping bag on the seat and squeezing down between the seats to pick up the bits that had fallen. Luckily, the bus floor was clean(ish) and I didn’t actually loose anything. I easily got off at the next stop, which is actually closer to home. I’m not planning to invest in a bus crafting box with oodles of handy compartments, but the incident is worth remembering. I've never thought of Amazon as anything more than a company, but their new search algorithm is scandalous. Web protesting isn't something I'm familiar with, so I may get this wrong, but here's a new deffinition of Amazon Rank. I just can't stomach this kind of homophobia. This is a double-post day because I think Otis deserves his own blog post. I showed him off at the office yesterday, because a few people had been puzzled when I started wiring his armature on my lunch break last Wednesday. He was universally declared a cutie (did that make him blush?) even when he was briefly mistaken for a space alien. The Good: Cute, pose-able, and he's made of a really fun yarn my mom sent to me. Its label says "Pokeberry Shetland" and it's a hand spun yarn she saw at a fair a few years ago. A wonderfully bouncy, varied texture, perfect for giving a small project loads of visual interest, and fun to touch. (Ya, my mom's great, and she's been spoiling me by sending lots of goodies to play with, so I'm glad I finally have a finished product to show her.) And I'm glad someone was inspired by pokeberries to make something so nice- so many would just see poke as a weed. The Bad: It's not as elegantly simple as the wool bears. The project needed a wire armature, and the eyes took a lot of stitching with sewing thread. My original idea was for much simpler eyes, but when I had the yarn and embroidery thread, it just didn't happen. The eyes were so frustrating that I had to put the project down at one point, reminding myself that this was supposed to be fun. 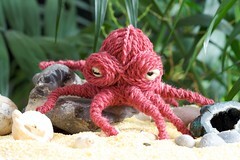 The Ugly: The wire shows through at the end of his little tentacles! I knew this would be an issue, and tried to wrap them tightly, but it wasn't enough. Next time I try to wrap a wire like this, I'll try doing two layers over the folded tips. Also, he has no suckers as I couldn't think how to make them. I feel sated with wool wrapping projects now. One of my colleagues suggested making a copyright infringing Kang or Karg doll, and another suggested making lots of fish friends, making me think of the possibilities of using two different colours of yarn to make a stripy fish. For now, I'm happy to be weaving on the bus. And I need to put a BIG THANK YOU to my P, for the photo shoot! His hobby is so convenient for me. So, I know from my forgetting that this is too much. So far (Thursday evening), I've worked on the quilt, got to the next stage of knitting, broken (and repaired) the loom, taken a bento for my lunch every day (plus have leftovers ready for tomorrow) and got through the PDR. Oh, and started the wool ball octopus. The weaving project was going well, though I think the bamboo skewer I was using as a shed stick may have been a bit intimidating. Then on Tuesday, the comb came off the envelope, and so the warp was unsecured. It may have had something to do with being stuffed into a bag along with a few soy milk containers. I had been sceptical of the PVA glue holding the comb, especially for withstanding twisting, so it wasn't too surprising. 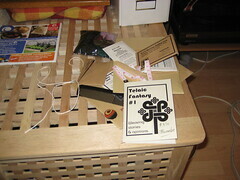 I left the weaving on the envelope, re-glued the comb, then sewed it down as well. 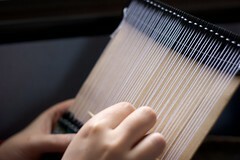 I managed to re-string the warp, and learned more about how the comb and board work to make the loom. So, not a disaster, a learning experience. 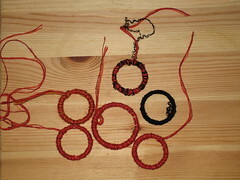 I hope to continue with the weaving next week. 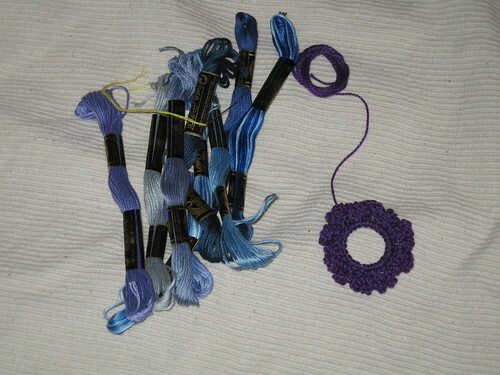 While the loom was being repaired, I started on the wool ball octopus, and I want to finish that tomorrow/this weekend. If I can find the yarn for the eyes (I know I have a bit of yellow yarn, but where?). Walking home on Friday, I was met by my P and one of our neighbours, who asked what I had been crafting on the bus. A bit embarrassed to say I had just been reading- I should have explained I was reading the DIY Weaving Club zine and project instructions. I got the package last week, and it does look good. 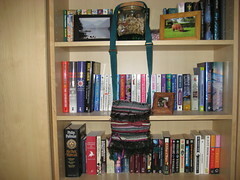 My project for Monday is from the DIY Weaving Club- a RagBag Loom. It took me a few readings to get my head around the instructions (due to me being scatter-brained rather than the instructions not being clear) but I think I’m ready to start it now. The loom and shuttle are glued together, and I’ve got my string selected! Missed the bus on Friday morning- it pulled away just as I reached the stop. I had to laugh, as I was slowed down by the Ska tune in my head, leading me to just mosey along. If it had been a House or Motown track, I would have been at the stop tapping my foot before that bus had got there. On Monday or Tuesday (memory fails me) it was cold enough in the morning to have condensation on the bus windows. “Don’t write your name!” an older sister insisted, then showed her sibling how to draw a dog face based on a stick man and turn the letters boy into a face. “I know those already” was the response, but they were new to me. I did work on the flower, but I’m not satisfied with the result. So instead of being finished, it has gone into another level of not finished. Not feeling inspired to do more flowers. Instead of getting up to work on the quilt this week, I just stayed in bed as late as I could. Still hoping to sew up a row this weekend. I do still want to work on it, but it is going very slow. On Friday, I got off the bus two stops early, took a few pictures and then a 10 minute walk to the office. As I get older, the public health messages about exercise make more sense. 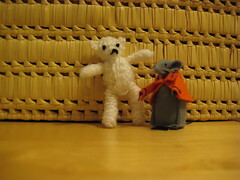 Anyway, I finished the bear on the weekend, after making a mouse at the guild meeting. I’ve put some more ideas for wool ball animals in my journal (the octopus looks like a good one), but for the commute on Monday I think I’ll try to finish a flower I started ages ago, so I can tidy it away. It bugs me that I can't get organized to do stuff. Does that mean I don't really want to do it? What I enjoy more than the doing is the planning- the thinking out how something could be done. The doing is a slog. But there's no other way to test the planning. Hmm. And I do still want to have stuff finished. 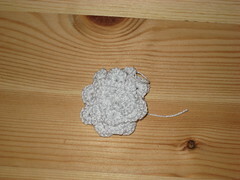 I got it together and crocheted a flower following Gipsy Quilt's instructions. Mine just isn't as cute as hers- perhaps aiming for 'cute' is a bit too high for me. I'm not sure if the thread I choose is wrong, or if I misunderstood the instructions. Mine looks more like a pile of crochet than like a flower. A bit disspiriting. Maybe it would work better with fewer spirals- I could cut it in two and make two flowers. Or it could be un-spiralled and used as a bit of lace. Anyhow, it's a good activity for the bus, even if I'm not totally happy with the product. 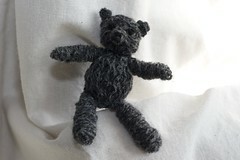 For next week, I'm hoping to work on combining crochet with small balls of yarn to make a mini-teddy-bear. If it works out, I'll need to find someone who would like a mini-teddy-bear. Another note: must remember the head of the directorate is occassionally on my bus. This isn't a problem, but it could feel like starting work before arriving at the office. Thursday morning, the woman who sat beside me on the bus was knitting! She was using a pair of small circular needles on what I think was a sleve for a sweater, but I didn't ask what it was she was knitting. I know, I should have said something encouraging, but I just didn't feel social. Anyway, she moved to a different seat (maybe I smell bad). I've had a cold for about a week now, and not been organized to get anything to do on the commute. My bad. Wednesday night I noticed one of the strips on my finger knitted scarf was running, and I did repair that. I don't understand how the ravelling started, but it was held up where the strips were linked together so it wasn't hard to repair. The scarf isn't perfect, but it is keeping my neck warm. This must be something that happens every winter, but I've only really noticed it this year because I've been playing with yarn so much: the skin on the inside of my thumbs is slightly chapped, just enough to catch on the fibers of the yarn (a recycled glove) that I've been using. It isn't so bad that it is annoying, just curious. The weaving itself is curious as well. 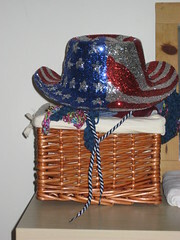 I'm thinking of calling it crazy weaving, like crazy quilting, suggesting a 'try anything' attitude. Because of the way I've wrapped the card, I have to intentionally mis-weave every so often. I can't be more accurate than that, because I think I'm unintentionally mis-weaving as well. The fabric I'm building up is very fluffy, and I'm not sure if it will hold together when I take it off the card. I'm also wondering if it feels softer because my hands are chapped? Anyway, I had considered taking it apart and starting again with a closer wrapped warp, but decided to stick with it the way it is. I'm curious to see how it will come out. On a non-bus crafting note, some quick maths has led me to the conclusion that I was rather un-realistic in thinking I can finish the pocket quilt this winter. It takes me about a week to add a row to it, and there are about 20 rows to add. So, with holidays, that makes it possible to finish in May, unless I dedicate some weekends to the project. As P has pointed out, it is already functional as it is big enough to keep my lap warm as I work on it. At the moment, I'll feel accomplished if I can complete one row a week, and if that means finishing in May rather than March, then that's the way it will have to be. 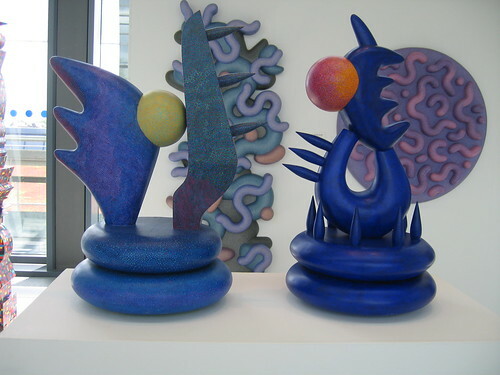 There are other, less concrete things as well: comment on blogs, remember birthdays, ideas for drawings or comics or stories, trying to garden on the balcony, tidying the apartment, try crazy quilting. And I’d like to try new things in 2009. I think I’ve become a bit too reticent, too habitual, too afraid to take small risks. So, just as a way of nudging my decision processes this year, I’m going to try new things, generally speaking, rather than opting for the same old thing. On a non-buscraft note, I’ve spent the intercalation doing a lot of embroidery.